New paper out in the British Journal of Educational Technology, co-authored with a host of people. Lead author Liz FitzGerald plus Natalia Kucirkova, Ann Jones, Simon Cross, Thea Herodotou, Garron Hillaire and Eileen Scanlon. Personalisation of learning is a recurring trend in our society, referred to in government speeches, popular media, conference and research papers and technological innovations. This latter aspect – of using personalisation in technology-enhanced learning (TEL) – has promised much but has not always lived up to the claims made. Personalisation is often perceived to be a positive phenomenon, but it is often difficult to know how to implement it effectively within educational technology. FitzGerald, Elizabeth; Kucirkova, Natalia; Jones, Ann; Cross, Simon; Ferguson, Rebecca; Herodotou, Christothea; Hillaire, Garron and Scanlon, Eileen (2017). 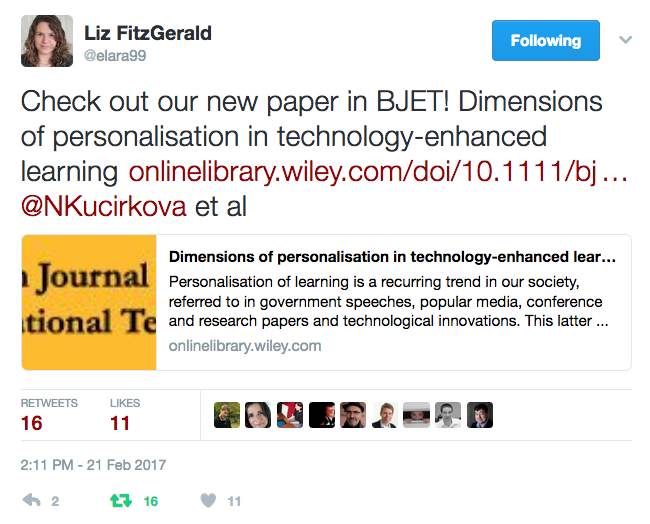 Dimensions of personalisation in technology-enhanced learning: a framework and implications for design. British Journal of Educational Technology (early view). This entry was posted on March 5, 2017, 2:10 pm and is filed under Journals, Papers, Publications. You can follow any responses to this entry through RSS 2.0. You can leave a response, or trackback from your own site.